When you cross the bridge, you can call into the various little shops built into it and you’ll marvel at how they’ve been constructed in such a small space. It is one of only 4 bridges in the world with shops across the full span on both sides. 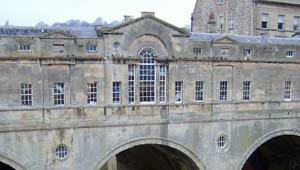 Pulteney Bridge is so important architecturally that it has been designated a grade 1 listed building. However, both sides are not equal in their attractiveness. The bridge is best viewed from the road behind Bath Abbey and most pictures of the bridge are taken from the South side because over the years, businesses the North side were allowed to extend their shops how they liked and the original look of the bridge has been lost. Pulteney Bridge is a public street and is open to the public 24 hours a day. The shops on the bridge though are only open during normal shopping hours.